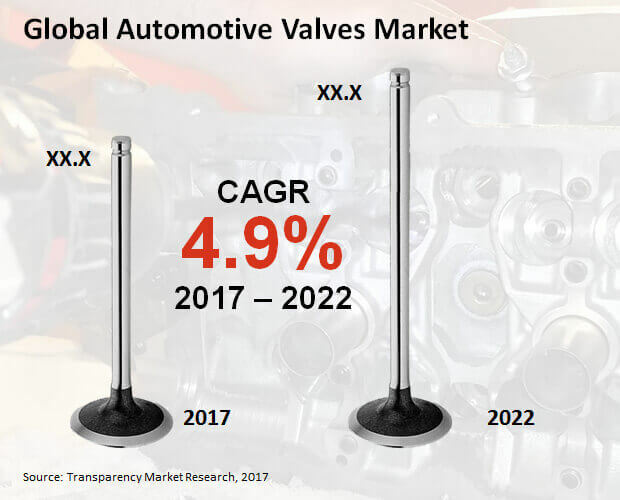 The ever-increasing cost of technology and fluctuating prices of valve components are some of the major hindrances to the global automotive valves market. These prices are in with respect to authentic valve parts from reputed brands, which cannot be afforded especially by local small-scale companies. Another reason that can significantly hamper the global automotive valves market deals with the rising number of electric vehicles. These vehicles need less number of valves installed in their systems as compared to conventional fuel powered vehicles. Thus, the growth of the electric vehicle industry can be a substantial factor for declining sale of automotive valves. However, the scenario is soon expected to change as improvement in technology leading to the manufacture of innovative valves will boost their applications. The information presented in this review is based on a TMR report, titled “Automotive Valves Market (Product - AT Control Valve, Water Valve, Tire Valve, Exhaust Gas Recirculation Valve, Solenoid Valve, Fuel System Valve, Thermostat Valve, Brake Valve, A/C Valve, and Engine (Inlet and Outlet) Valve; Vehicle - PHEVs, HEVs, BEVs, Heavy Commercial Vehicles, Light Commercial Vehicles, Luxury Passenger Cars, Premium Passenger Cars, Mid-size Passenger Cars, and Compact Passenger Cars; Sales Channel - OEM and Aftermarket; Function - Electric, Pneumatic, Hydraulic, and Mechanical and Pilot-operated) - Global Industry Analysis, Size, Share, Growth, Trends and Forecast 2017 - 2022”.